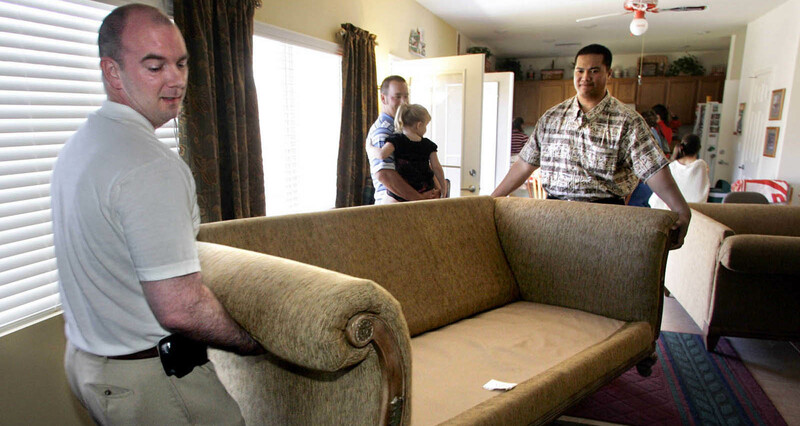 Discovery Church members Kirk Butler, left, and Vili Fetapai move furniture back into a living room after a Sunday service at their pastor's home January 23, 2005. The church is waiting for approval to move to a temporary industrial location. For the estimated 5,000 people moving into Clark County every month, the task of setting up a new life — including finding a new place to live — can be a daunting one. The endless checklist people face from setting up utilities, phone services, cable and Internet, finding a job, going to the DMV, selecting a bank, picking the right school, or even in the rare cases of needing to locate an emergency room or hospital — can be overwhelming. The Las Vegas Sun's online moving guide offers new residents a helping hand with useful tips and Web sites to visits, as well as practical information to help you join the more than 2 million people who have already settled into the Las Vegas Valley. — New media managing editor Dave Toplikar, web content editor Andy Samuelson, multimedia technician Billy Steffens, and interns April Corbin, Michael Lyle, and Natasha Shepherd compiled this report.